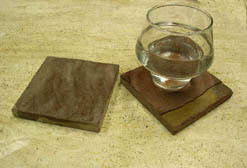 The beverage coaster sets that you will find below all include coasters that are made entirely from natural materials. 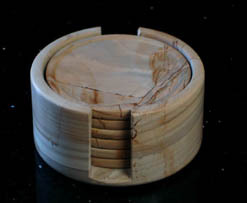 When these stone materials form, they develop unique colors and hues, which form and reform in one of a kind patterns across the surface of each piece. The result is that every single coaster sold to any of our customers, from the sets below, will be completely individual and unlike any other in the entire world. Unique fossilized formations, visions from a million years ago, arrange and re-arrange themselves in one of a kind patterns across the surface of each and every fossil stone coasters we offer. 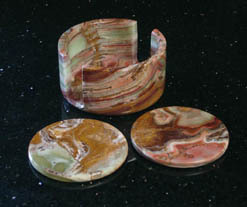 Brilliant swirls of multicolor alight in random patterns upon the surface of these elegant marble coasters, create unique formations of reds and golds, greens and yellows, all set into a milky white surface which has been polished to smooth perfection. The set of six is completed with a matched holder, which has been delicately carved, cut, and polished from a matched piece of the beautiful imported, asian onyx stone. 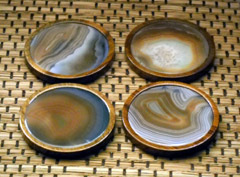 The appeal of these exquisite beverage coasters isn't just their stylish charm, nor is it merely the glisrtening perfection of the polished marble. 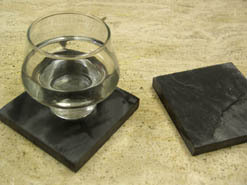 The hidden secret gem of these coasters are the tiny black and charcoal formations that dot the surface of the stone. 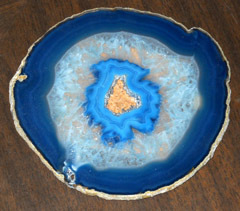 That is because they are million year old dendritic fossil impressions, pictures of living creatures that roamed the earth eons ago, now available as a conversation piece, or a set of six conversation pieces, matched with an attractive marble holder. Soft and subdued tan creamy colored marble, is broken by whisps of dark brown contrast. They creap across the face of the stone, like lazy curls of smoke, dancing playfully along the lines of the coasters face. They move different in each surface, some coming heavily in strands of thousands, others moving more subtly, simply slipping along the edge of the stone. A beautiful display of multicolored glass chips, contrasting light on dark tones randomly assorted, to create a vision of visions, a portal into two dozen worlds, each one contributing to the greater design found in the outer whole. 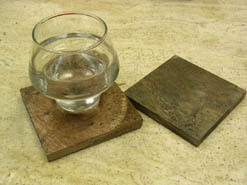 Stunning and shimmering, these glass coasters also boast the unique ability to absorb moisture into the canals that run between the various chips. 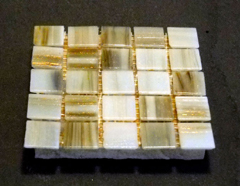 These Flash Cloud absorbent glass mosaic coasters are a spectacle of colors and contrast, with dark tempestuous tones dominating the whole, broken by streaks of color which snap through the hazy dark to inject vigor and excitement into the countenance of their smooth perfection. 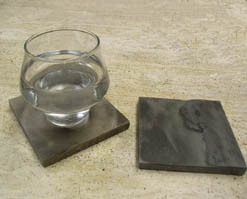 Mated to a natural sandstone base these coasters are the height of functionality and beauty, united into a single piece. Bright, sunny, warm and friendly, almost glowing, the translucent hues catching sunlight and reflecting it back out into the space, and then further, actually emitting energy into the very nature of the room, an amicable energy that suffuses the space with peace and good will. 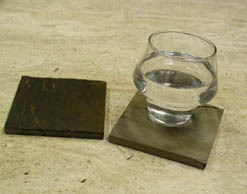 All of this is combined with the canal design and a sandstone base piece which gives the beauty of these coasters an accomplice in function. 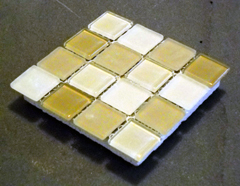 The world's first totally absorbent mosaic glass beverage coasters. 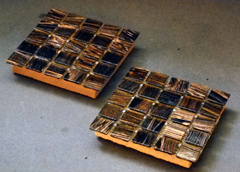 Unique, hand crafted from a variety of assorted glass chips, mixed and matched and arranged to create a one of a kind pattern on the surface of each individual coaster. These lovely mosaics are then combined with a canal design and a sandstone base to make them both highly absorbent, and give them a non slip traction. A wild assortment of glass chips, reds and whites, browns and blacks, all mixed and matched in a random assortment of colors which serves to form a vision of energy and dynamic tension which you can almost feel radiating off of the surface of these pieces. 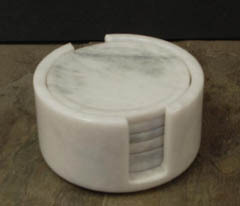 The pure white background of these attractive marble coasters is a vision of perfection itself. Glistening in polished beauty, it is the solid unchanging light of white that symbolizes unbroken precision. However in perfection, there is little that can be called unqiue. And so, the coasters are instead hinted with whispers of smoky cloud, which gracefully alight upon the white, giving each piece a personality which is unique in its own right. 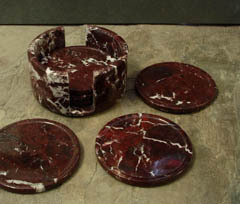 Brilliant crimson tones alight on the surface of these attractive marble coasters, giving the surface of each piece a kind of deep intensity which is breathtaking and spell binding, even in such a small and innocuous piece. However thsi effect is multiplied by strings of white lightning, which rip across the surface of the stones, creating moving visions of contrast and passion which are unique in each individual piece. Brilliant hues of semi translucent green swirl mysteriously throughout the surface of these beverage coasters. in each coaster this swirling is different, creating unique patterns which almost seem to dance across the face of the stone. Brilliant amber hues alight gracefully across the surface of these coasters, landing in rings, or streaks, or slivers of color, which form against one another in ranks of contrasting hue. The final vision is one of hazy intrigue, with layer upon layer of varying tones alighting over one another in inconsistent, yet unique arrangements. Purple and pink passion rises to a crescendo, with peaks of contrast creating powerful images of abstraction across the surface of these elegantly polished gemstone drink coasters. A natural vision found trapped beneath the polished surface of the semi precious agate, a stunning vision for everyone to behold. Rainbow sandstone is a highly absorbent coaster material, whose surface consists of gently alightning bands of dramatic color. 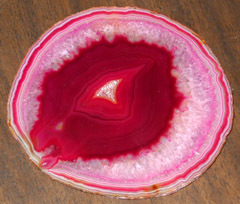 These bands consist of reds, yellows, purples, and golden tones, which arrange themselves into unique, one of a kind patterns, all across the face of the material. 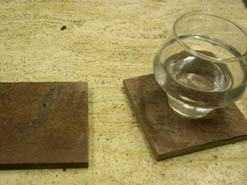 The result is a set of highly functional coasters that are also truly one of a kind and beautiful. Soft red tones mix with more dramatic crimson clouds, with the whole array falling over itself, merging, shifting, and fading, in intoxicating patterns, to create an effect of multicolored reds. All of this can be seen through a kind of soft mist, which gives each coaster a subdued feel. 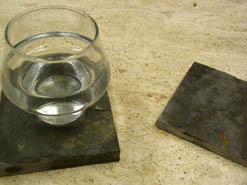 However this highly absorbent material will come alive the second you place a moist glass upon its surface. 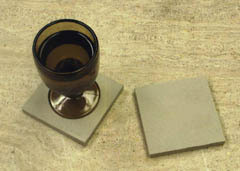 The surface of these highly absorbent sandstone beverage coasters is a subdued backdrop, a vision of a dessert being gently windswept by the mid day breeze. 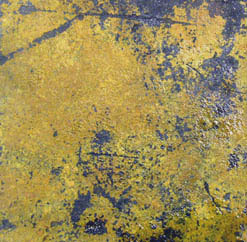 Yet they still retain a unique quality, due to the subtle shifting of contrast and texture, which occurs in subdued grades across the face of this stone. 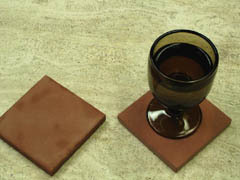 Red gold tones of coppery sunset dominate the surface of these powerful slate beverage coasters. This surface consists of a unique array of tiny formations, a multitude of multicolors, each a tiny piece in a much larger puzzle, that can be seen when you step back and drink in the entirety of these powerful stones. The entire effect is enhanced by larger black speck formations, which serve to add even more personality to a stone that is rich with power. A million hues of subtly falling color alight upon the surface of these attractive slate drink coasters. Soft greens mix with earth toned browns and grays, to create a rustic backdrop. The entire effect is then illuminated by a hazy golden light, that seems to hover just above the natural tones in the stone. The final effect is an integrated vision of earthen beauty that is unique and one of a kind in each individual piece. 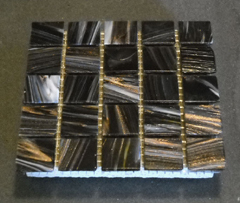 The mountain black coasters are an array of mixed midnights, a conglomeration of gently contrasting tones of black, like multiple night time shadows all merging and converging with one another, to create a unique vision of drakness, which is somehow multicolored in its monotone demeanor. The backdrop of the multi africa coasters is a deep black vision of purest night. This unbroken perfection is darkness embodied, like the depths of a well, or a starless night. however this powerful stillness is ripped asunder, burst open by unqiue visions of gold, red, and yellow, which explode powerfully across the face of the stone, illuminating the dark like a bonfire at midnight, casting intense hues into the mix and making each and every coaster a unqiue vision of the earths natural beauty. Murky grey brown tones sit easily upon the surface of these coasters, and yet are broken, shattered by a collection of colors that seem to emerge from somewhere deep within the coaster. These visions of gold and red quickly dominate the surface of the stones, vying with the subdued backdrop for visual dominance of the face of the various coasters found within the set. Deep dark red tones, a thousand variations of crimson hue, swirl and merge across the surface of these attractive natural stone pieces. A million shades of red, each one alighting like a shadow on the face of the stone, lending a distinctive demeanor to the various pieces. No two coasters are ever exactly alike. Though they match, the power of their natural formation ensures that each one has a distinct personality. Gentle waves of brown, tan gold, alight in swirls across the surface of the world. Dipping and tucking, sliding through and around one another, they create unique formations. Zipping around like strands of light, dipping beneath horizons of contrast, alighting upon one another, before falling back into the subdued face of the naturally absorbent sandstone. 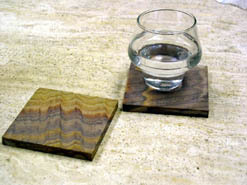 A deep dignified demeanor dominates the surface of these attractive coasters. Grays and browns swirl, dancing with one another, yet maintaining a formal presence that does not diminish the elegant facade of these powerful pieces. 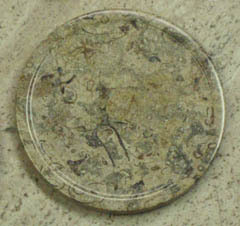 Alighting upon this subtle face, are lines of deep, dark contrast, which appear at random, lending a unique personality to each and every coaster in the set. Bands of hazy light sift seamlessly across the face, moving from one end, through a dust cloud of subtle color, and alighting finally upon the other. As they move they shift and fade, reappearing in some places, dreamily drifting in others. However the final effect is a banded piece, though banded by shadows and visions, and a set of coasters which are powerful in their subtelties. A million tiny points of dark set against a soft tan lighted backdrop. These points each land where they will, like a dust cloud always approaching, but never quite overwhelming. Subdued beauty, a vision of the earth in its most subtle form. Sold in sets of four, highly absorbent, able to soak the moisture right off of a sweaty glass. Highly functional, attractive, and sure to enhance the beauty of any setting.